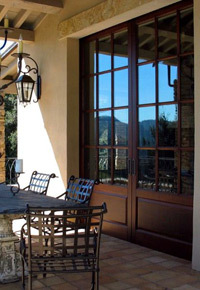 Sapele lumber is popular for flooring, siding, trimming, and doors. Sapele lumber (Entandrophragma Cylindricum) is indigenous to several countries in Africa. Most of our Sapele lumber originates from the Democratic Republic of Congo. Sapele has become popular as a more moderately priced substitute for the more traditional Genuine Mahogany. The color of Sapele is a dark brownish-red and can sometimes move into a purplish-red hue. Here at the J. Gibson McIlvain Company we separate all our Sapele into Flat Sawn (cathedral) and Quarter Sawn (straight) grain. Occasionally, we get in a shipment with several highly figured Pomelle boards. Sapele is a very popular product for flooring, door and window manufacturing, siding, architectural paneling and millwork, interior and exterior trim, and S4S work, because it is weather resistant and highly stable. 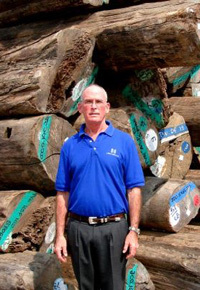 The J. Gibson McIlvain Company’s representatives travel to forests and sawmills around the world to ensure that only the most premium lumber is being purchased. By traveling to the source, we can also guarantee that legal and sustainable forestry practices are being used. The Sapele lumber which we import from Africa is dried to European standards at a level of 12-14% moisture content. Our next step is to air dry the Sapele lumber in our yards for several months before placing it in our kilns to take the moisture level down to the 6-8% range, the standard expected for wood distributed in the United States. The J. Gibson McIlvain Company carries Sapele in thickness 4/4 through 12/4, in varying widths and lengths from narrow and short to wide and long. 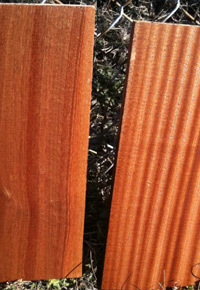 Nationally, we ship 500 board foot custom pulled orders all the way up to truckloads of Sapele and other wood products. Let us know what your next project or your current stocking program requires, and we’ll get right to work on it. The J. Gibson McIlvain Company now carries the Sapele hardwood plywood to match our Sapele lumber. We can also provide FSC (Forest Stewardship Council) Certified Sapele for your next project. Please be sure to contact us online or call us toll free at (800) 638-9100 to reserve your Sapele lumber today.